The Curly Letter of Amsterdam. By Ramiro Espinoza and Rob Becker. As an adolescent, I began to notice the distinct style of script lettering on the windows of Dutch “brown pubs” (bruine café’s) – a few in The Hague, where I grew up; most in Amsterdam. In 1983 (when in my twenties) I encountered an informal chat with one of the makers, published as an article in the national printing yearbook. Other than that, Dutch research on this unique lettering work was virtually non-existent – although the work seemed to carry a lot of cultural and historical luggage. It took an Argentinian type designer, who’d come to the Netherlands in the early 2000s to study type design at KABK Type + Media, to do serious research, determine the pedigree of those letterforms, and find the two craftsmen of the post-1945 period who had developed this style, and painted texts on hundreds of pub windows. 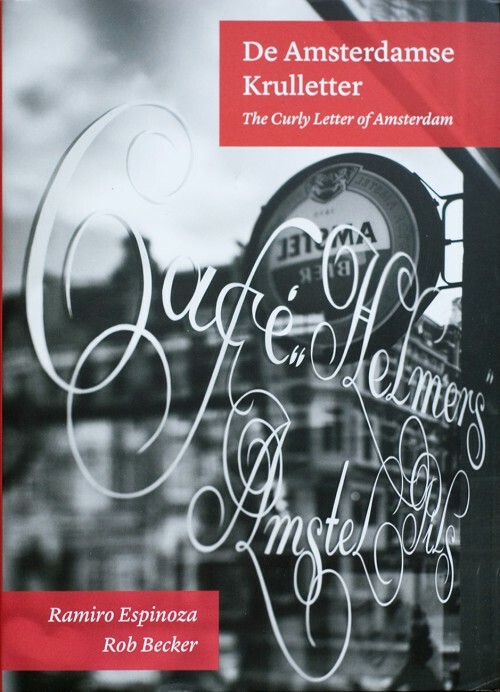 Having met Ramiro Espinoza a few times in the year he was studying in The Hague, I’d stayed in touch, followed his research, and invited him to publish the short version of his essay on the cafés’ “Krulletter” (curly lettering) style in Hand to Type. A couple of years later, Ramiro’s Krulletter research was finally done; he’d commissioned photographer Rob Becker to record the work that had survived the changes of the past few decades – a wise decision, as lettering work on glass is vulnerable, and some pieces photographed for the book have already disappeared. I happily contributed the introduction, which described Ramiro’s history and career and borrowed some of the information from my interview with him for the October 2012 Creative Characters newsletter. Double page spreads from the Krulletter book on Ramiro’s Béhance pages. “What are the origins of the exuberant swash letters that can be found on the windows of many of Amsterdam’s most traditional bars? Who painted them? Was it a collective creation, or the work of a lone gifted sign painter? How old is this style? For almost a decade Ramiro Espinoza thoroughly researched the refined, swirling lettering style, examining every surviving example in Amsterdam, Maastricht and Ghent in an effort to answer these questions. He compiled his findings in De Amsterdamse Krulletter – The Curly Letter of Amsterdam, a comprehensive, lushly illustrated and beautifully produced (bilingual English–Dutch) book. With its publication Ramiro hopes to raise awareness for this little-known chapter of the Dutch graphical tradition, bringing it into the present and making the lettering style relevant again.